Pork chops should be easy, but are they? Not usually. I was either faced with a greasy fried mess or a dried baked mess. The solution? Fry them AND bake them. Observe. Crunchy deliciousness on the outside, moist, juicy pork goodness on the inside. 2.In a small bowl, beat together the eggs and milk. In a separate small bowl, mix the bread crumbs, Parmesan cheese, and parsley. 3.Heat the olive oil in a large, oven-proof skillet over medium heat. 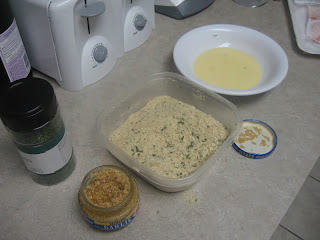 Stir in the garlic, and cook until lightly browned. Remove garlic, reserving for other uses. 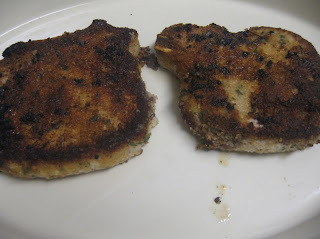 4.Dip each pork chop into the egg mixture, then into the bread crumb mixture, coating evenly. 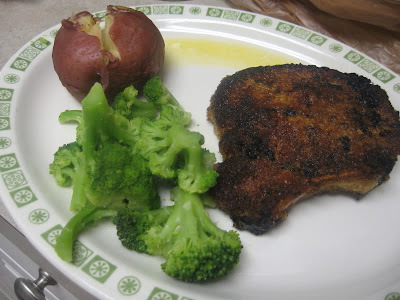 Place coated pork chops in the skillet, and brown abut 5 minutes on each side. 5.Place the skillet and pork chops in the preheated oven, and cook 25 minutes, or to an internal temperature of 160 degrees. These are so good. I'll make them this week, I think. That looks like the absolute perfect meal for me. The one thing I hate about frying is the oil spitting and spatting at me. I know you can use a cover to help cut down on that, but somehow I always manage to get splatter burns, like when I remove the splatter cover to turn the meat. Anyway, yum to the max. I don't know which part looks the best. I want to eat ALL the things.